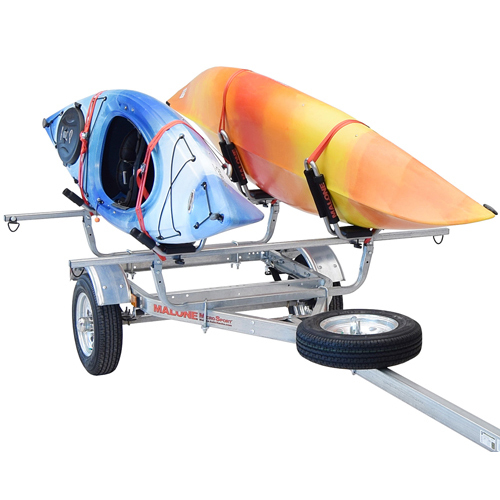 Yakima Rack and Roll Kayak Trailers and Malone MicroSport Trailers are the highest quality sports trailers on the market today. Using a sports trailer means no lifting above your head. Plus, you can see your gear and travel with the confidence that it is secure. 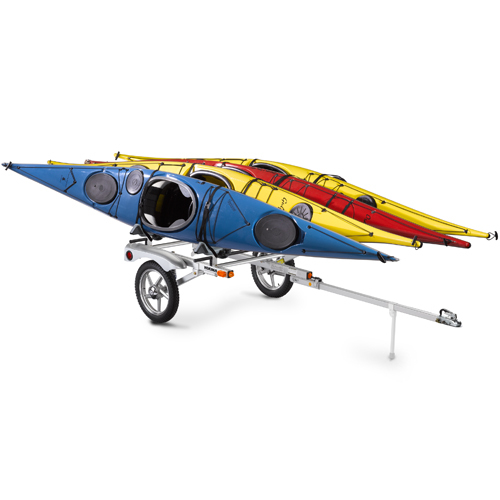 Yakima Rack and Roll and Malone Micro-sport Trailers utilize crossbars that allow almost all kayak, canoe, SUP, surfboard, windsurfer and bike carriers to attach. Yakima offers 2 trailer sizes: Rack and Roll 78" Wide Trailer and Rack and Roll 66" Wide Trailer. Malone offers 6 trailer packages - 4 of which include kayak carriers: Malone MPG460G MicroSport Trailer, Malone MPG460XT MicroSport XT Upgraded Trailer, Malone MPG461GS MicroSport Trailer Package with Spare Tire Kit and 2 SeaWing Kayak Carriers, Malone MPG461GU MicroSport Trailer Package with Spare Tire Kit and 2 Saddle Up Pro Kayak Carriers, Malone MPG461G2 MicroSport Trailer with Spare Tire, J-Pro 2 Kayak Carriers, Malone MPG462G2 MicroSport 78" Trailer Package with Spare Tire Kit and 4 J-Pro II Kayak Carriers. Sports Gear Trailers are practical alternatives to car roof racks.